There is a more efficient way to manage browser tabs without compromising on the number of tabs you want open or the speed and stability of your computer. KBrowser is an extension for Firefox, compatible with Windows, Mac and Unix operating systems. It has been designed to tackle the common and frustrating problems of tabbed browsing. 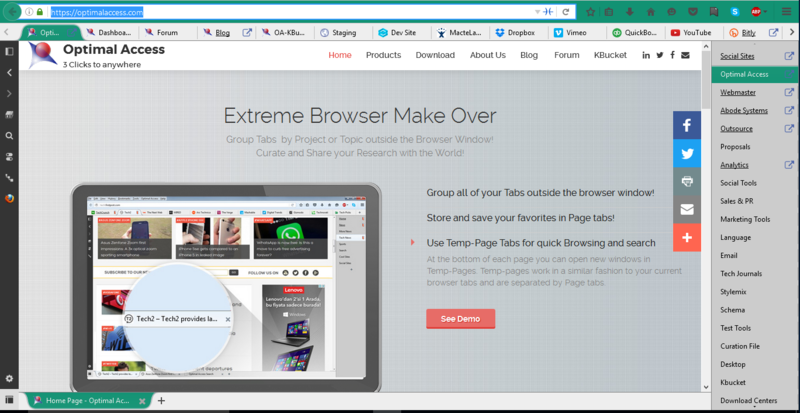 Group Tabs allow you to group and save dozens of tabs per browser window. You can do it in a clean and uncluttered manner with clearly named folders. You can organize the Group Tabs whichever way is convenient to you. It enables more organized and efficient browsing without restricting the number of pages you wish to access. For instance, you can categorize folders based on such themes as ‘sports’, ‘entertainment’, ‘news’ or ‘review sites’. By naming folders, you can easily visit the one you want and access page tabs without any confusion or loss of time. No need to play a guessing game by trying to figure out pages from just the favicons that are visible to you. Inside each page tab, you can create new temporary pages at the bottom. Closing page tabs closes the window but retains the tabs in place. You can go back to tabs whenever you want. With the windows closed, you can save resources and make your computer work more efficiently. An open door icon lets you know which group has an open page tab. When you close the group, all the pages inside the group are closed. KBrowser allows you to manage maximum information by making the best use of available space. The extension takes web navigation to the next level and doesn’t make your computer work too hard.